Tamera Stackhouse (left) of Magical Meadows therapeutic horseback riding, Warsaw, Indiana, was named the 2010 Woman of the Year. 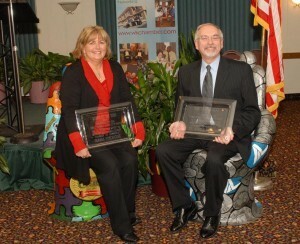 The 2010 Man of Year award went to Grace College and Seminary president Dr. Ronald Manahan (right). The leaders of two Fellowship of Grace Brethren national and cooperating ministries were honored Thursday night by the Kosciusko County (Indiana) Chamber of Commerce. Jeff Carroll, CEO of Grace Village Retirement Community, received an award for Grace Village being named Employer of the Year, and Dr. Ronald Manahan, president of Grace College and Seminary, received the Chamber’s “Man of the Year for 2011” award. Manahan’s honor is bestowed on an individual for contributions to the Warsaw/Winona Lake community and is sponsored by the Warsaw Times-Union and Lake City Radio. Manahan has served on the Board of Directors of Kosciusko County Chapter of the American Red Cross, Committee to Commemorate Dr. Martin Luther King, Jr., Inc., Foundation Ministries Inc., Lakeland Christian Academy, and Symphony of the Lakes. He currently serves on the Board of Directors of Kosciusko County Community Foundation, OrthoWorx, and Orthopedics Capital Foundation. This year, the chamber will be celebrating its 100th year in the community. OrthoWorx Executive Director Brad Bishop noted that Manahan’s leadership helped get rid of the “town and gown” gap between Grace College and the community. Bishop also recognized Manahan and his role in the building of the Orthopaedic Capital Center. “He did something many thought wasn’t possible – he brought the heads of the major orthopedic companies together to collaborate on a major joint project,” Bishop said. Grace Village Retirement Community was recognized as the Business Leadership Network Employer of the Year. Jeff Carroll, CEO of Grace Village, accepted the award. The award is designed to recognize those businesses that are leaders in hiring people with disabilities and providing them with training. Carroll explained earlier that the award was based, in part, on Grace Village’s experience of seeing an employee learn to read while in the employ of Grace Village. Incorporated in 1974, Grace Village is dedicated to preserving the richness of life for seniors in a comfortable and secure Christian setting. Grace Village is affiliated with the Fellowship of Grace Brethren Churches and seeks to do all in the spirit of Jesus Christ. Nearly 300 people from all walks of life call Grace Village home, residing in 48 condo style homes called “Robin Hood Homes”, 117 Independent Living Apartments that include studios, efficiencies and 1 to 2 bedroom apartments and in the Licensed Assisted Living 52 studios and suites. The Village’s Health Care offers both intermediate and skilled nursing care and there is also a new Rehabilitation Center with 12 private suites. Grace Village is situated on a beautiful 43 acre campus east of Winona Lake on Wooster Road. Steve Miller, a member of the Winona Lake (IN) Grace Brethren Church and CEO of the local hospital, is the chamber’s new board chair, and a new member of the board is Tim Ziebarth, who directs the alumni program at Grace College and Seminary. The 2010 Dimensions of Excellence Award for Business of the Year was presented to Silveus Insurance Group of Warsaw. Several members of that organization’s top management, Scott Silveus and Craig Snow, are also from the Winona Lake church.